Polished Concrete involves the process of grinding concrete with progressively increasing grits of diamonds to produce a durable, easy to maintain surface for numerous applications. Densifiers and sealers are applied to increase durability and minimize penetration of stains into the concrete slab. From warehouses to retail spaces, educational facilities to manufacturing floors, the versatility of polished concrete has both aesthetic and maintenance benefits. 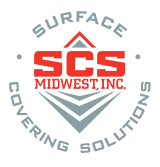 Whether you are in the market for a high gloss show piece or a functional matte finish, SCS Midwest Inc. has the decades of experience necessary to provide you with the Polished Concrete floor you’re looking for.